Formed in 1828 from a part of Yazoo County, Madison County takes its name from Pres. James Madison. Located in central Mississippi, Madison County began as a growing frontier area with a substantial slave population. Now part of the Jackson metropolitan area, it borders the Ross C. Barnett Reservoir and contains a portion of the Natchez Trace Parkway. Madison County towns include Camden, Farmhaven, Madison, Ridgeland, and Flora, and Canton serves as the county seat. In the 1830 census, Madison County’s population consisted of 2,806 free people and 2,167 slaves. Ten years later, as a cotton-producing area, Madison’s free population had increased to 3,997, while its slave population had mushroomed to 11,533—third-most among the state’s counties. The growing county also had a small but substantial nonagricultural population, with 253 people working in commerce and manufacturing. By 1860 the free population had reached 5,260, while the slave population had nearly doubled again to 18,118, a number that trailed only Hinds County. With 77 percent of its residents enslaved, Madison ranked tenth among Mississippi’s sixty counties. Madison’s soil and labor force were extraordinarily productive, ranking third in the state in growing corn, fourth in cotton, fifth in Irish potatoes, and first in sweet potatoes. The county had only 169 industrial workers, most of them employed in small mills and blacksmith shops. In 1860 Madison County’s thirty-nine churches ranked it fourth in Mississippi, and the variety of denominations was greater than in most of the state. Madison was home to fourteen Methodist churches, eleven Baptist churches, six Presbyterian congregations, three Episcopalian houses of worship, two Cumberland Presbyterian churches, two Catholic churches, and one Christian church. Madison County’s population remained roughly the same in the decades after the war, with 19,907 African Americans and 5,946 whites in 1880. The county continued to practice mixed agriculture, with substantial concentrations of cotton, corn, and sweet potatoes. Madison ranked sixth in the state in the number of hogs. Like many black-majority counties, Madison County had a high number of tenant farmers and relatively few landowning farmers (28 percent). By 1900 Madison’s population numbered 32,493, of whom 25,918 (79 percent) were African American. Madison County had almost 200 immigrants, mostly from England, Germany, and Ireland. While still rural, Madison had 260 industrial workers. About half of Madison County’s 11,000 church members were Baptists, most of them either Missionary Baptists or Southern Baptists. The county was also home to about 3,500 Methodists, most of them in the African Methodist Episcopal Zion Church or the Methodist Episcopal Church, South. With more than 800 Catholics, the seventh-highest number in Mississippi, and close to 500 Presbyterians, Madison maintained a greater variety of churches than much of the state. The German community in Gluckstadt was largely Catholic. Madison County native Belle Kearney was born in 1863 and attended Canton Ladies Academy before emerging as a leader in Mississippi movements for temperance and woman suffrage. In the twentieth century, members of the powerful Hederman family owned and ran the Madison County Herald. By 1930 Canton was a growing town of 3,252, but the large county continued to have an agricultural economy, with well over six thousand farms, more than 80 percent of them operated by tenant farmers. Major crops included cotton, corn, and cattle. The Canton civil rights movement began with efforts at voter registration in the 1950s and picked up strength when the Congress of Racial Equality, the Student Nonviolent Coordinating Committee, and eventually the Council of Federated Organizations addressed issues of voting, segregation, education, and violence. These groups organized a boycott, a Freedom House, and a Freedom School. Activists faced violence during the Freedom Summer of 1964 and again in 1966 during the March against Fear. 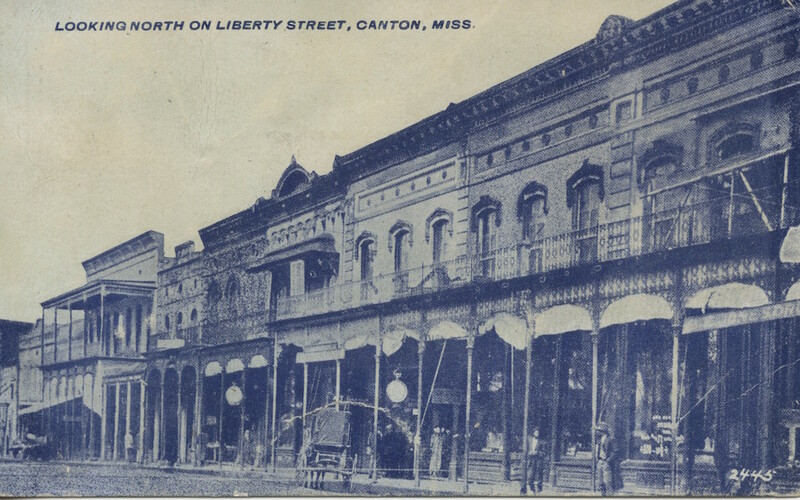 Madison County landowner and businessman C. O. Chinn was a relentless organizer whose courage Anne Moody documented in Coming of Age in Mississippi, and Canton native Annie Devine was one of the organizers of the Mississippi Freedom Democratic Party. By 1960 Madison County’s population had declined slightly to 32,904 but remained overwhelmingly African American (72 percent). Despite growing economic diversity, the county remained an agricultural center, with more than 36 percent of workers employed in agriculture. Madison County farms grew the third-most corn in Mississippi and produced substantial amounts of livestock, cotton, oats, and soybeans. Manufacturing workers, especially in furniture and wood products, accounted for 17 percent of the labor force. Madison County was also home to two oil wells. By 1980 the county’s population had increased to 41,613. In 2010 Madison County, like many of its neighbors, had a white majority and a small but significant Hispanic minority, primarily from Mexico. With 95,203 people, the county had grown 190 percent since 1960, one of the state’s greatest proportional increases during this period, and had become among the largest in Mississippi. As in neighboring Hinds County, Madison had developed a small Asian population. In the twenty-first century, Madison County has one of Mississippi’s lowest poverty rates and highest rates of per capita income, in large part as a consequence of the 2002 opening of a major Nissan plant. Mississippi State Planning Commission, Progress Report on State Planning in Mississippi (1938). Mississippi Statistical Abstract, Mississippi State University (1952–2010). Charles Sydnor and Claude Bennett, Mississippi History (1939). University of Virginia Library, Historical Census Browser website, http://mapserver.lib.virginia.edu. E. Nolan Waller and Dani A. Smith, Growth Profiles of Mississippi’s Counties, 1960–1980 (1985).